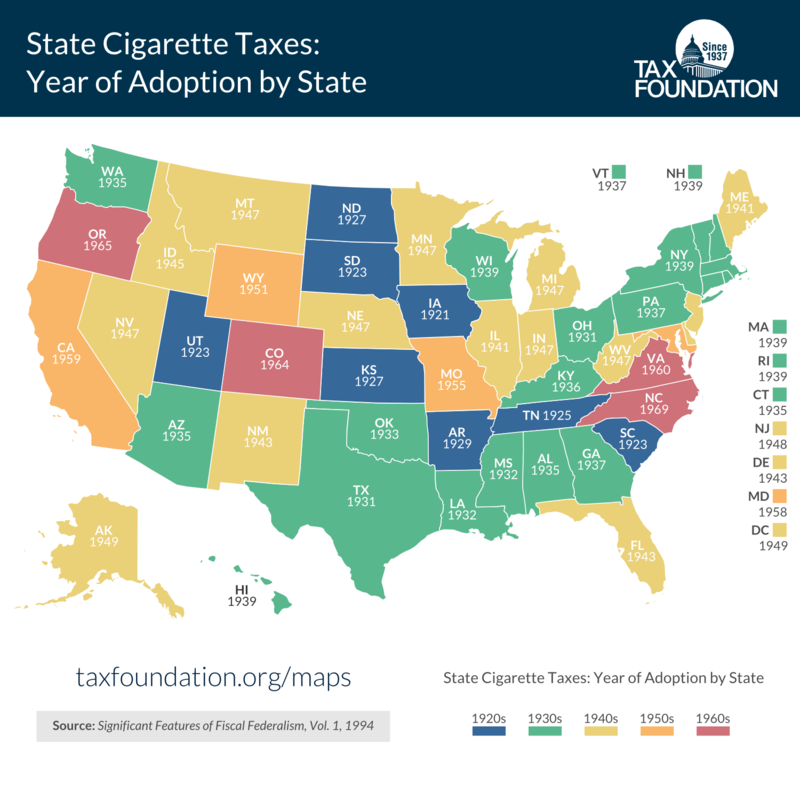 When Did Your State Adopt Its Cigarette Tax? This week’s map takes a look at when each state first adopted its cigarette tax. Although the federal government had been taxing tobacco since the 18th century and cigarettes specifically since 1862, states did not begin doing so until the early 20th century – when manufactured cigarettes surpassed plug tobacco as the highest-grossing tobacco product in the country. Iowa led the charge on raising revenue from this industry when, in 1921, it became the first state to levy a statewide excise tax on cigarettes at a rate of 2 cents per 20-pack. By the end of the 1920s, seven other states had adopted their own cigarette taxes. Facing declining collections from property and income taxes in the wake of the Great Depression, 19 states jumped on board in the 1930s, and by 1950 40 states and the District of Columbia were levying a tax on cigarette sales. The last state to institute a cigarette tax was North Carolina, which passed its cigarette tax in 1969. Many states started taxing the purchase of cigarettes before they imposed a broad-based sales tax. Of the 45 states with sales taxes, only fourteen (mostly in the West and Midwest) waited to enact an additional excise tax on cigarettes after already having a general sales tax in place. Oklahoma and Washington, D.C. both adopted the two taxes simultaneously. Today, tax rates on cigarettes have grown so large that consumers in some states have turned to black markets to procure tobacco. The latest estimate is that 57 percent of all cigarettes consumed in New York are smuggled into the state. Additionally, just 18 percent of adults in the United States are smokers today, raising concerns about the stability of this narrowing base as a source of state revenue. Current state cigarette tax rates are here in a chart, and here in a map. Read more about cigarette and tobacco taxes here.